Man stepping out onto another world: It might be the most dramatic moment of the twentieth century (some say of all history), the moment Earth-bound creatures have imagined for millennia, and it will only be possible if it’s mapped out in micro-increments, with nothing left to chance or a faulty human memory. It’s a narrative made up mostly of numbers. 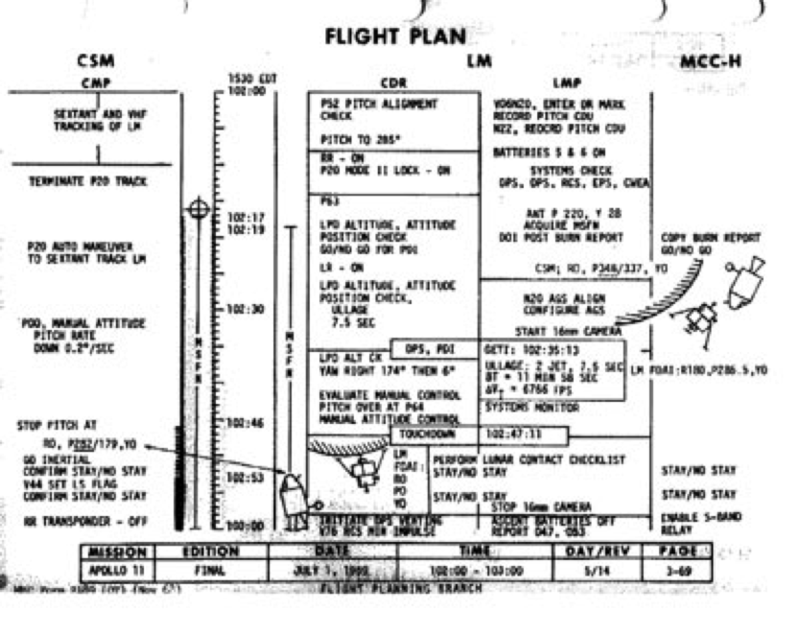 The flight plan was really very well written, Neil Armstrong himself will acknowledge. He might be its most avid reader. Some of its sequences have been stamped in neat block letters on his spacesuit sleeve, reminding him to UNSTOW BAG/SCOOP/HAMMER, UNPACK SRC. Houston wants near-zero probability of an unscheduled surprise.